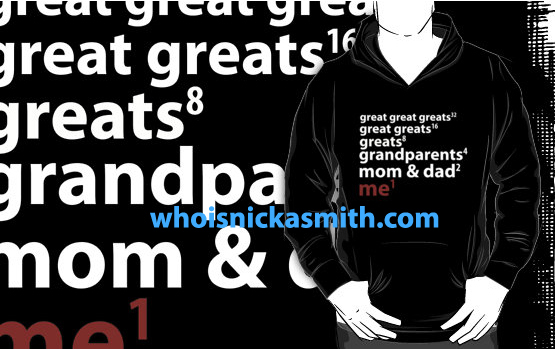 me to the power of 1 | genealogy t-shirts - who is nicka smith? this past april i finally made a visit to the family history library in salt lake city, utah. this is like the mecca of genealogy research. it’s the las vegas for a family researcher. there are hardly any windows or clocks in the library. you hardly ever know what time it is and you don’t want to leave because you’re afraid you’ll miss something. days and days of genealogical fun! 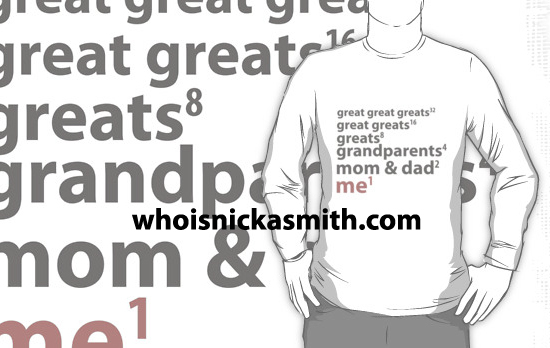 during this trip, i came up with an idea to create some cool genealogy shirts. this was because one of my companions was wearing one and she told me she bought it in the gift shop at the hotel we were staying at. i had never seen one myself. well, actually one that wasn’t cheesy. i wanted something simple, fashionable, and that would be a conversation starter. i also didn’t want it to look like someone as young as me wouldn’t like it. the photos below are what i came up with. to do this, i used my existing redbubble account. this is where i sell some of my photography as fine art prints. redbubble is a great resource to sell art as well as things like custom t-shirts, stickers, and more. there are a number of styles, colors and fits to choose from including options for adults and kids. prices start at $24.54. the basic message of this first shirt is that there were a lot of people that came before and feed directly into one person. we rarely think about this on a daily basis. what do you think about them? 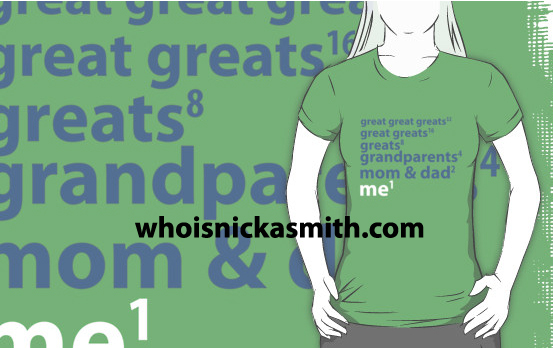 Pingback: surname blues - new genealogy t-shirts : who is nicka smith?